Despite the significant control government exerts over Americans, few understand its organizational structure and the roles of its various departments and offices. For people to gain the full benefits of government programs and avoid the snares lurking among government bureaucracy and arcane regulations, they must clearly understand the powers and functions of each part of the government. 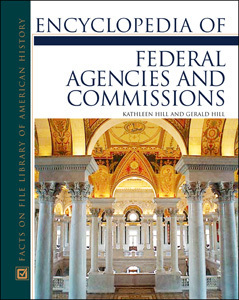 Encyclopedia of Federal Agencies and Commissions is a comprehensive guide to the various branches of the federal government, making information about them readily available and accessible. Clearly written entries cover all branches of the federal government as well as the history and inner workings of the agencies that function under them. "...provides a useful overview of the history, organization, and responsibilities of the federal agencies and commissions within American government and will be a welcome addition to any collection serving primarily high school or lower division college students." "...well-organized...A current, highly informative guide to the federal bureaucracy for the general public that will also be welcomed by students and researchers of public administration and government...Highly recommended..."